(a) Reveal any defect of vision. (b) Assess how well the eyes work together to provide comfortable and effective vision. (c) Screen for ocular diseases and potentially fatal conditions of the eye or brain as well as systemic disorders such as hypertension and diabetes. Early detection of these are paramount to an individuals well-being. It is important to bear in mind that an eye examination is not merely to assess whether you can read a letter chart or not, and does not automatically result in a spectacle prescription. HOW OFTEN SHOULD AN EYE EXAMINATION BE CARRIED OUT ? 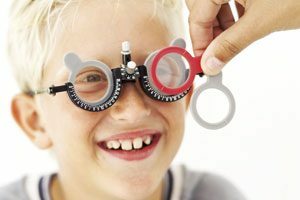 Generally an eye examination is advised every two years, but an annual test may be considered necessary and children are often tested every six months. However, if problems are experienced earlier than the recommended re-test date do not hesitate to seek advice. A child does not have to be able to recognise letters in order to have his/her eyes examined and therefore it is never too early. An assessment of visual ability can be made in a baby and throughout infancy. This assessment increases in accuracy until around five years of age where it virtually matches that of an adult. Children should not be disadvantaged when they start school simply because a correctable eye defect has gone undetected.